Shiuly or Night jasmine (nyctanthes arbor-tristis, family: verbenaceae) is one of the most popular and loving plant in Bangladesh. 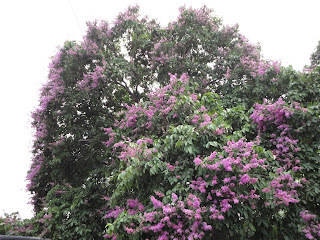 It is a large shrub or small tree with scattered branches, reaching 5-7 m in height. Bark is whitish grey and rough. It is grown in gardens and homestead for its sweet-scented flowers. Leaves are pale green, rough in both sides, opposite, serrated, ovate, 7-10 cm long and 3-6 cm wide, apex acute, petiole small. It's a deciduous plant; many leaves fall in winter and spring. It looks little bit beautiless then, but rest of the time it looks great. Other English name: Coral jasmine. Flowers are showy, white, corolla tube orange, deeply scented, dense cluster at the end of the stalk. Flowers occurs in August-September mainly. They bloom at the night and fall off before sunrise. Fruits are flattened, round. Two seeds are found in two different chambers. The plant is easily propagated by seed. Leaves are used in fever, rheumatism, physical weakness, worm infection and dandruff. Seeds are antibilious and expectorant. Its yellow dye is used in different kinds of sweetmeats. Falling flowers are used to prepare garland. The Hindu community of Great Bangla as well as Indian subcontinent use these in worship. The passionate Bengali poets and writers have written a lot about it.